Do you need a Nissan windshield repair or replacement? At National Auto Glass, we can do just the right job for you at unbelievable speed and unexceptionably reasonable costs. We know our job well and achieve perfect results for repairing windshield of each Nissan car that comes to our workshop. Nissan Windshield: Should I Replace or Repair? We understand that replacing your Nissan car’s windshield can be an expensive and time-consuming process. Therefore, we put in all our efforts into making seamless repairs that wipe out the need for a replacement. We have a record of repairing some really large cracks and making the windshield look like it never went through anything rough at all. Therefore, even if you feel that the crack on your windshield is beyond repair, and replacement might be the only option, get your vehicle to us and allow us to inspect it. We just might be able to fix your windshield eliminating the need for a replacement of that expensive glass. However, there’s a catch here: besides the size of the chip, there is also another very important factor that determines whether you would need to replace your windshield or a simple repair job would suffice. That factor is position of the chip. If the chip is too close to the edges, a replacement might most often be the best choice for you. Automobile repair services typically suggest a distance of 4 cm or less between the chip and the closest edge to it for this purpose. In any case, we advise you to bring your Nissan car to us and let us inspect the chip. 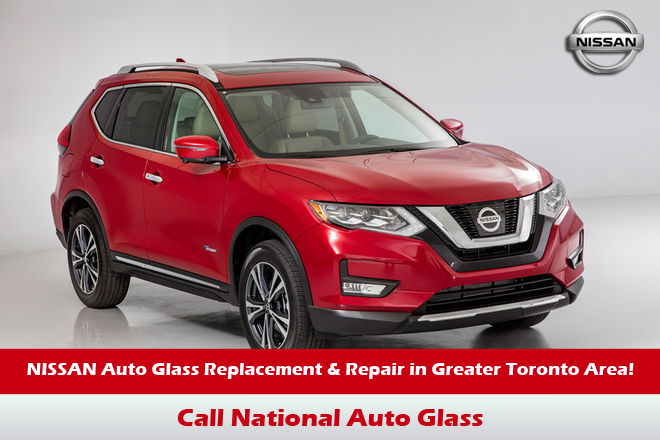 Should a replacement be necessary, we perform Nissan windshield replacement with the best quality glass. A poor quality glass not only looks unappealing on your vehicle but also creates a safety hazard for you. Therefore, we make sure we replace windshields of Nissan cars only with the highest quality glass certified by OEM (Original Equipment Manufacturers). Our glasses are sturdy and scratch-proof, so you can depend on them to keep your car safe to drive for a very long time. We work with all models of Nissan including Nissan Rouge, Altima, Pathfinder, Juke, Sentra and other models. Will you be able to make an insurance claim on your Nissan windshield repair? National Auto Glass maintains great relationships with most insurance companies. So if your insurance covers expenses on repairs, you will be able to get your claim very quick and easy when you get your vehicle repaired by us. Besides, we can also do a lot of talking with the insurance company on your behalf. If you dread having to explain your point to insurance companies in order to get your claim amount, you will be delighted by the amount of assistance we provide in this matter. What’s more, we won’t charge an additional penny for doing this bit. Since our inception over twenty years ago, we have worked devotedly on all our tasks, big or small. We understand the urgency that accompanies car repair jobs and therefore do our best to repair your vehicle within a day. You can count on us for same day service for windshield repairs. Our customer service is the friendliest and most professional one you can ask for, and that will make your experience of a Nissan windshield repair/replacement easier than you’d ever have had before.